In the Maurienne Valley, and readily accessible by road from Albertville, Chambéry Savoie Mont Blanc and Grenoble. 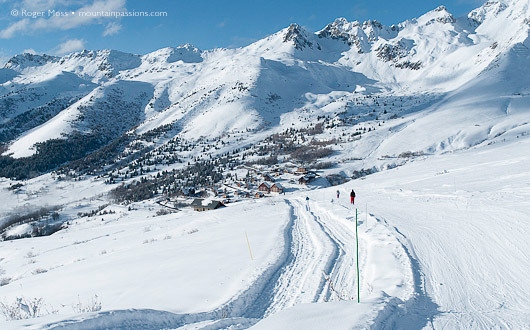 It shares its ski terrain with Valmorel, which lies in the Tarentaise. Snow cover is helped by the presence nearby of peaks surrounding the 3V resorts of Méribel and Saint-Martin de Belleville. Known as Le Grand Domaine, the groomed terrain sits roughly equally on either side the 1993m Col de la Madeleine (a celebrated climb in the Tour de France) with Saint-François Longchamp to the south and Valmorel to the north. It might sound dull but in fact it’s anything but, since along the way lie ridges and valleys to break things up and give variety to the skiing. The terrain is mostly reassuring, with plenty of wide blue cruising runs for intermediates who like to cover some distance. There are some scenic reds, too, along with quite long greens. Blacks are more limited, though, but there’s off-piste all around, plus some good cross-country terrain around the village of Celliers. 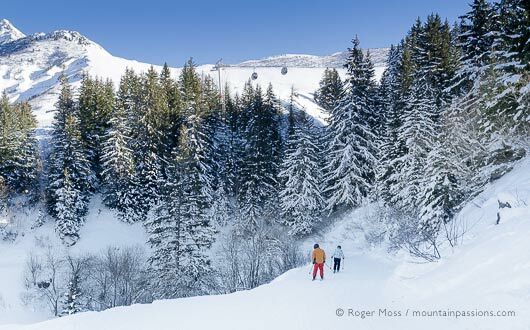 As for getting around, Saint-François has the technological edge over Valmorel, much of its terrain being served by three high-speed chairlifts, whereas on the other side you’ll encounter twice as many drag-lifts. Happily, things there are now improving. Most accommodation is located around Saint-François Longchamp 1650, chalet-style development predominating at Plan Mollaret, while Le Hameau has convenient front-de-neige apartments. There’s more, but with a slightly dated, no-frills look, down at Saint-François Longchamp 1450, to which you can ski down and get a chairlift back, making the other villages effectively ski-in/ski-out. Saint-François’ image as “La Montagne Conviviale” is well-founded, and we found a friendly atmosphere both on and off the mountain. The resort might have been long overlooked by style-seekers, but the relaxed, unpretentious approach to things grows on you (and keeps things affordable). 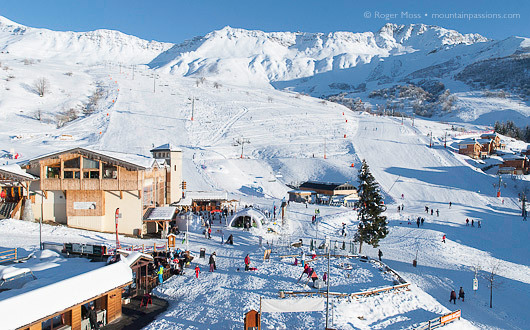 Why go skiing in Saint-François Longchamp ? For anyone looking for quality, family-friendly skiing in the French Alps yet which offers olid value with few obvious compromises, this has to be a serious contender. The terrain isn’t for the most part overly-demanding, but you can cover some distance around the combined ski area, cruising much of it on wide, reassuring blue-graded pistes. The front-de-neige is a fun place to be, too, with lots of organised activities and safe play areas for children. But if you’re solo or child-free don’t discount it, for the skiing is great, and this side of the mountain has a lot going for it as a base from which to explore it all. This side of the mountain has the better lift system. 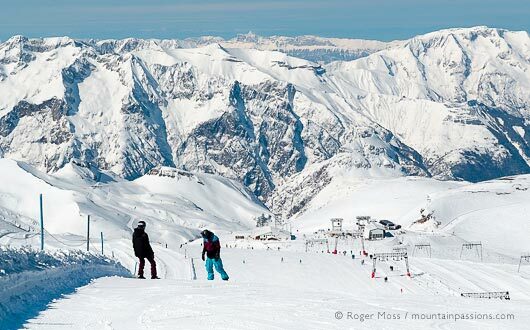 Full lift pass means you ski in both the Maurienne and the Tarentaise. Friendly, welcoming and unpretentious ambiance. Short transfers from Chambéry Savoie Mont Blanc & TGV high-speed rail links. 1450 village now looking tired. Nightlife on the restrained side. 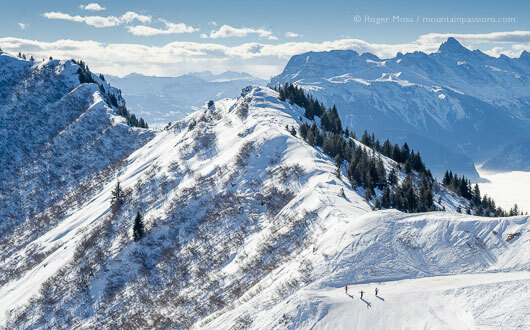 Explore the topmost and outermost pistes, for peace and big views. 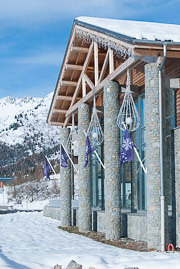 Le Lac Bleu 3* hotel has recently refurbished rooms now with Savoie style cosy decor and modernised en-suite bathrooms. We loved the superb view over the slopes from our 4th floor room. 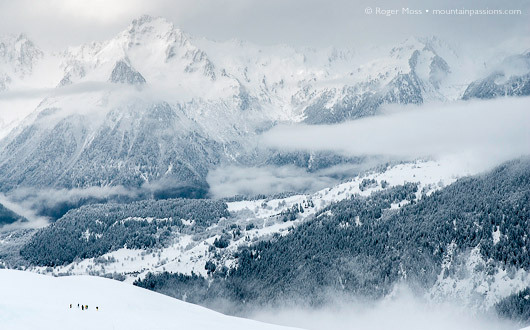 The hotel restaurant and bar share this unrivalled view over the front de neige. Take the half-board option and you dine here every evening. Friendly staff serve a varied 3-course fixed menu, although there’s little understanding of vegetarian options. Those with special diets need to consult with the chef well in advance. All drinks are extra. A couple of downsides - there’s a drop-off point but no hotel parking (outdoor public parking is nearby), and there’s no hotel lift. If you’re on the top floor you’ll need to be fit! On the upside, the hotel owner and the staff are helpful and welcoming, it’s warm and comfortable, and just 50m from the lift, with convenient ski lockers on the ground floor. Aqua, fitness and spa centre with a bar and bowling alley on the upper floor. Look out for offers from your accommodation provider for the spa, otherwise entry is a steep 19 euros. There’s a good hydrotherapy pool with cool and warm areas, aqua bikes and weights, plus two Jacuzzis, and outside pool. Sauna and hammam also available with pool entry. NB: In France Speedo-style swim shorts are compulsory for men. The best time to go is before the lifts close, as it can be busy. Late opening one day per week. There are a few on-mountain restaurants. We found La Banquise was the best, but the village has the best choice of food for all budgets. 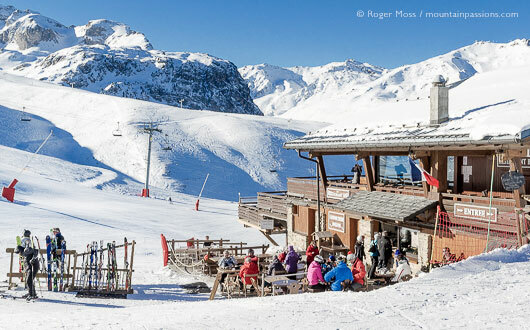 There are excellent burgers, pizzas and crêperies, plus a vegetarian café, all close to the front de neige at 1650m. In the evenings try Le Plancher des Vaches (+33 (0)4 79 59 37 14) situated in the Résidence Quatre Vallées for its authentic wooden chalet style interior and French regional cuisine. Built in 1922 by the Automobile Club of France, La Banquise is on the mythical Col de la Madeleine - well known by followers of the Tour de France. There’s a terrace with panoramic views, or head inside for a cosy lunch comprising local dishes and delicious desserts. Cheap café bar situated between the Hotel Lac Bleu and the Tourist Office with a sought-after sunny terrace. Sandwiches from 3.50€, soft drinks from 3€, beer 3€, coffee 1.50€. Perfect for an après-ski drink. Take the autoroute A43 to Chambéry, then follow direction Turin. Exit at junction 26 'La Chambre' and follow signs for the resort. The nearest airport is Chambéry Savoie Mont Blanc, (90km). Lyon, Grenoble, Geneva and Turin are all possible but transfer times and occasional delays make them less convenient. Shuttle buses are available, see MobiSavoie for details. There is a TGV service from Paris either via Chambéry or direct to St Avre La Chambre (12km), where you can transfer by the local bus service or taxi. A flurry of newly-falling snowflakes is just the kind of welcome we like when arriving at a ski resort which is completely new to us. Even without that, as we glimpse the village of Saint-François Longchamp ahead of us twinkling in the dusk, the effect would be just as intriguing. The final approach takes us past the rear of the development overlooking the front-de-neige, so there’s little to see until we’ve parked, unloaded the car and are peering at things from the balcony of our hotel room at Le Lac Bleu. We like what we see, and head down to take a first look around, among plenty of other people who obviously have the same idea. First impressions: clean, cheerful and unpretentious. … we’re floating over a mountainside made pristine by the previous night’s snowfalls, the few freshly-dusted trees here and there adding the finishing touches. 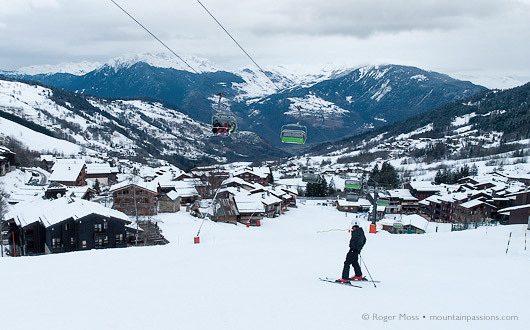 Next morning we return, crunching our way – just a few steps, really – to the Lune Bleue six-seater chairlift. The onward ride proves doubly uplifting since we’re floating over a mountainside made pristine by the previous night’s snowfalls, the few freshly-dusted trees here and there adding the finishing touches. At the top station we glide off and turn to take in the wide views across the valley. From here the village already looks a surprisingly long way away. A few minutes later it’s growing slowly larger as we cruise down Shogun, a blue-graded link run to the base of our next lift, the Soleil Rouge four-seater. This time we ski off at a healthy 2271m, where the snow quality is excellent, giving plenty of edge grip for the run down the red-graded Samourai, which either drops skiers back at the base of the lift, or feeds neatly onto a blue-meets-green cruise over to Le Hameau, where it’s down to a choice between the Sapin drag-lift or the Marquis high-speed six-seater chair). The big views continue as we wind our way down through the tree-line on this enjoyable blue piste, which finally flattens a little where it’s joined by Les Coqs, a red offering a rather more direct drop from the top of the lift. 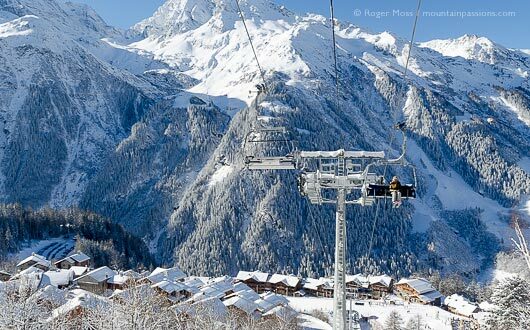 From here it’s a gentle cruise back round to the base of the Marquis chairlift – a necessary haul for anyone heading beyond La Hameau and back to the slightly higher developments around Plan Mollaret. By the time we’re back to our starting-point the scene has transformed into what are fast becoming full-on blizzard conditions. Sure enough, things clamp down and we call it a day, but with a sense of achievement from what we’ve managed to fit in before the latest falls intervened. The Col de la Madeleine marks the transition between Saint-François Longchamp and Valmorel, both of which lie within the French département of Savoie. In summer you can drive (or cycle, if you’re feeling energetic) rapidly between these near neighbours. 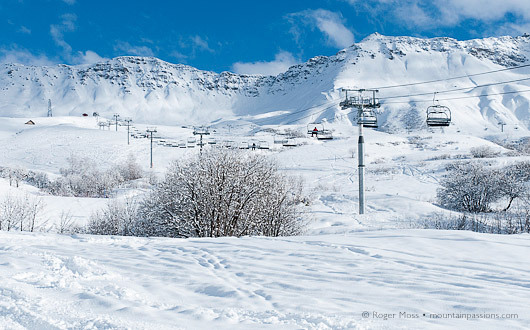 In winter, however, everything changes – road access to Valmorel being via the Vallée de la Tarentaise, while for Saint-François Longchamp it’s from the Vallée de la Maurienne. The following day promises to be much better, but not until early morning mists have cleared, so we begin low – lower than we’ve been before, in fact, with a run down to Saint-François Longchamp 1450. We float silently down the gentlest of pistes on freshly-groomed powder in the company of other skiers who have the same idea, and feel like seeing the results of the overnight snowfalls. Even lower down the landscape is spectacular, every branch of the trees lining the piste laden with the weight of snow currently frozen to them, before the sun breaks through and softens the early morning permafrost look. It’s a great way to start the day, and underlines the fact that when it snows here it really snows. At the end of the trail, however, it’s clear that we’re edging closer to the snowline, and the final drop to reach the chairlift requires a spot of dodging and weaving around a few tell-tale slushy areas which are now beginning to appear as the first shafts of sunlight begin to break through the fast-dispersing mists. As the Clochettes fixed chairlift climbs sedately back into the sunlight we get to see ahead of us the mountains revealed in all their snowy magnificence. The lift drops us back onto the lower section of Rimolard, the same blue piste we skied yesterday, for a run round to the Marquis high-speed chairlift. Now, in near-perfect conditions we’re in the mood to put some mileage beneath our skis. 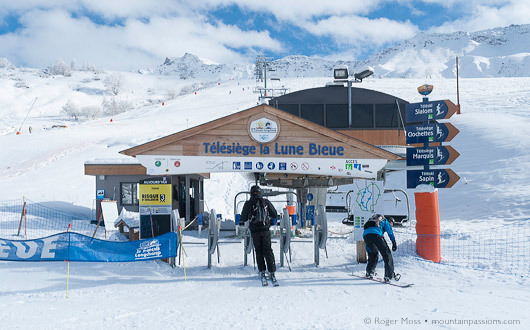 Things begin gently, with a green link run past the Soleil Rouge chair (another viable onward option) and across to our chosen next lift, the Lune Bleue six-seater, which hauls us smoothly out of Saint-François Longchamp 1650 and drops us at 1678m. Taking the higher-altitude route of Soleil Rouge instead of Lune Bleue, followed by the Côte 2305 drag-lift, opens up a choice of Red-graded runs on either side of the ridge below the 2832m peak of Le Cheval Noir, but as it is we follow the Platière blue run down to the Frêne chair-lift. The powerful six-seater drops us above the Col de la Madeleine, beyond which the terrain gives way to that of Valmorel. A red-graded blast down Canyon feeds onto La Grande Combe — a blue which, true to its name, hugs the side of a narrow valley and brings us to the foot of the Rozet chair-lift. Once over the ridge we get our first glimpse of the village and its broad valley location, looking pretty snug amid snow-covered conifer forests. For some reason the sun hasn’t yet found this side of the mountain, but we press on and ski down to the heart of the still-developing village. 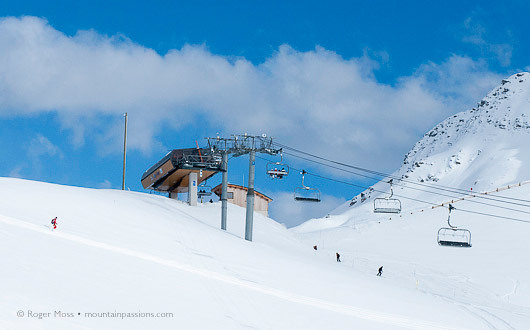 In fact, we ski right through part of it to join the Altispace I chair-lift, which will haul us from 1345m up to 1659m. The Perspex covers on this high-speed lift suggest that this must be an exposed and potentially chilly ride, but it’s a quick one, despite a brief slow-down at an intermediate station for a seamless transfer to the second-stage Altispace II chair. Once we’ve left the lift at the top we pause briefly for a look back at the ski area we don’t have time to explore during this visit, but one in which we’ll certainly be taking a keen interest in future, since the village has become better known (and edged further upmarket) with the arrival of the CGH La Grange aux Fées apartments. We’re pretty sure that a lot of first-time visitors must be pleasantly surprised when they venture over the Col de la Madeleine and onto the ski terrain of Saint-François Longchamp. The homeward run, on snow still in near-perfect condition thanks to temperatures having barely moved since the early morning, is a joy. We might still have yet to discover Valmorel’s particular attractions, but for now we already know that there’s great cruising over on this side, on wide intermediate pistes which are just what most of today’s skiers have come to expect from modern resorts. But that’s not the whole story, for there are also some good reds to explore which are perfect for those who are building up their fitness and with it their technical abilities. True, for experts there are few blacks, but by compensation there’s lots of off-piste potential all around to explore, ideally in the company of a knowledgeable qualified local guide who can reveal the best high-mountain routes. 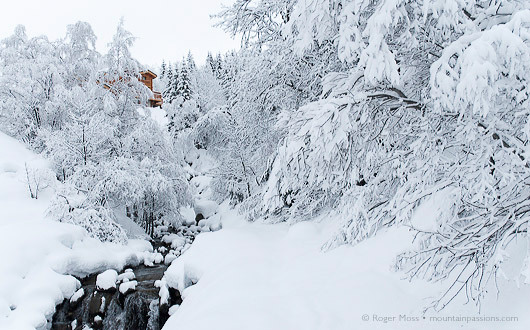 For all its cosy image — and the strong suspicion we have that this must be one of the most underrated resorts in the French Alps — Saint-François Longchamp is just that: a modern resort, but one which clearly has no intention of abandoning its principal advantages, namely a friendly, welcoming and secure setting plus great appeal to value-aware families.